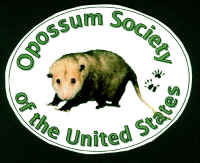 By becoming a member of the Opossum Society of the United States you will help protect and preserve North America’s only marsupial…the Virginia opossum. Your membership dues and donations go directly to the care of orphaned and injured opossums. We are run entirely by volunteers. 1. An informative new member packet consisting of Diet, Medical, Orphan / Injured Care and Educational Literature. 2. Quarterly “Possum Prints” Newsletters containing Tips and Advice from Wildlife Rehabilitators and others in the wildlife health field. 4. …and A Warm, Fuzzy Feeling! The Opossum Society of the United States welcomes and encourages contributions from veterinarians and others in the wildlife health field. If you have an article, tip or idea you would like to share with our members then please submit your work for possible inclusion in the “Possum Prints” quarterly newsletter. We reserve the right to edit all submissions.